The city of San Francisco has proposed a new ban on all e-cigarettes that haven’t been approved by the FDA from being sold in the city. The catch? No e-cigarette has been approved by the FDA. The FDA regulates new tobacco products before they’re sold in stores, but e-cigarettes have so far largely avoided that kind of oversight in the Trump administration. Herrera held a press conference yesterday where he alleged that the Food and Drug Administration has “failed to do its job” ever since e-cigarettes were deemed to be under the FDA’s jurisdiction in 2016. “These products are on the street despite the fact that the required pre-market reviews have never been done,” City Attorney Dennis Herrera said at a press conference yesterday. Public health officials have always been interested in protecting children from tobacco, but as fewer kids start smoking and instead use nicotine replacement products there’s been an emphasis in recent years on stopping kids from getting access to e-cigarettes. The most recent large survey conducted by the University of Michigan found that 21 percent of high school seniors were vaping in 2018, almost double the rate from a year earlier. 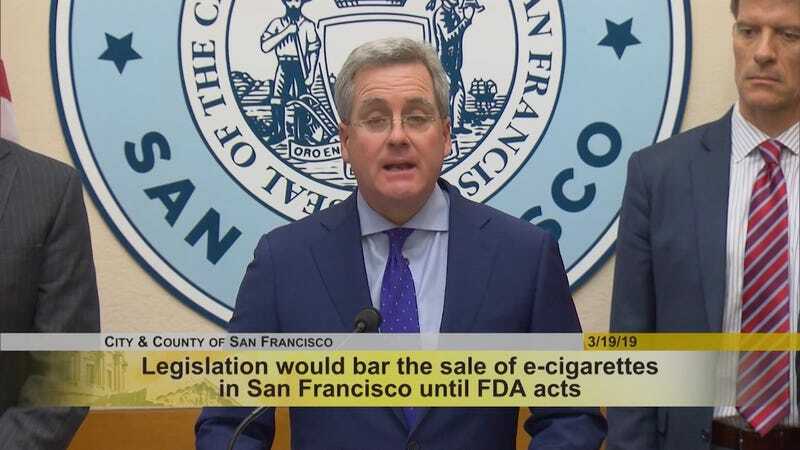 The San Francisco City Attorney’s Office, in conjunction with city Supervisor Shamann Walton, has introduced legislation to the city’s Board of Supervisors to ban the sale of e-cigarettes until the FDA does a thorough review. In addition, officials from San Francisco, Chicago, and New York sent a letter to the FDA yesterday demanding that the agency expedite its review and hand over any documents that would allow those cities to make their own determination about the safety of e-cigs. We share the City of San Francisco’s concerns with youth usage of tobacco and vapor products, including our own. That is why we have taken aggressive action nationwide, including stopping the sale of flavored products to retailers and supporting strong, restrictive category wide regulation to keep e-cigarettes out of the hands of youth. But this proposed legislation’s primary impact will be to limit adult smokers’ access to products that can help them switch away from combustible cigarettes. We encourage the City of San Francisco to severely restrict youth access but do so in a way that preserves the opportunity to eliminate combustible cigarettes. This proposed legislation begs the question - why would the City be comfortable with combustible cigarettes being on shelves when we know they kill more than 480,000 Americans per year? The public health community in the U.S. is currently conflicted about the idea that e-cigarettes are good for helping people to quit smoking traditional cigarettes. On the one hand, e-cigs are theoretically a “harm reduction” device that’s better than smoking. But on the other hand, e-cigarette companies want as many people using their product as possible. Herrera made it clear at yesterday’s press conference where he stands on the issue. Other anti-tobacco advocates point out that Big Tobacco companies have invested heavily in e-cigarettes during recent years as smoking rates decline and vaping becomes more popular. Altria, the parent company formerly known better as Philip Morris, made a $12.8 billion cash investment in Juul this past December and now owns 35 percent of the company. Oddly enough, while most members of the Trump regime have been trying to dismantle regulations across all of government, outgoing FDA head Scott Gottlieb has been one of the few officials who has signaled that he’d like to ensure more regulations are in place to keep e-cigarettes out of the hands of kids. Gottlieb met with representatives from Juul and Altria last week and was clearly disappointed with the discussions. “At some point, regardless of your view on whether or not these products could help currently addicted adult smokers transition off of cigarettes, the youth use is so widespread and so rampant that whatever redeeming public health value these tools could potentially have, and they haven’t demonstrated that yet, it’s offset by the youth use,” Gottlieb said. Gottlieb announced his resignation a few weeks ago and his last day is April 5. The White House has not yet nominated anyone to replace him. San Francisco City Attorney Dennis Herrera obviously feels differently about the job that Gottlieb and the FDA have been doing and thinks that it’s not accomplishing enough.